as is the way in which the tone can be consciously influenced by the whole body, even the voice box. spill-over passages in the fugues, or the variation technique in the Passacaglia. Concerto in D minor, which he rewrote for organ. This is a magnificent piece, in which the majestic riches of the organ are united with Vivaldi’s lively instrumental virtuosity. played on a tubax (a new 21st century instrument, like a kind of double bass sax). improve the trainee organist’s pedal work. As well as his ten fingers, which can operate three or four keyboards on the organ, an organist also uses both feet. that it is just these few simple notes that make up the foundations on which the whole powerfully-constructed building work rests. This Passacaglia shows Bach at the very height of his variational powers. rhapsodic beginning is a real toccata, to which Bach has added an Adagio and a Fugue. of a tradition inherited from Buxtehude. this is the BWV 578, one of Bach’s earliest large-scale organ fugues, also known as the ‘Little Fugue’, which has already been subject to multiple arrangements. 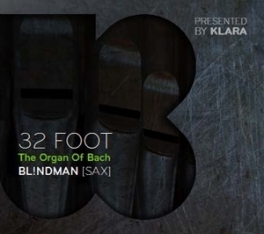 32 FOOT / the Organ of Bach is a co-production of BL!NDMAN, Klara & deSingel.